Over at The Hill’s Congress Blog, I’ve a post regarding H.R. 2279, the Reducing Excessive Deadline Obligations (REDO) act, which House leadership is expected to bring to the floor on Thursday. As is indicated by the bill’s title, the REDO act would cull needless and impractical statutory deadlines, and thereby limit opportunities for “sue and settle” policymaking. I’ve excerpted the post below. Read the whole thing here. To be precise, H.R. 2279 would allow Congress to mitigate the ills caused by an overabundance of deadlines in environmental laws enacted during the 1970s. At the time, statutory deadlines, by which time federal agencies must execute their duties, were perceived as an innovation in Congressional oversight. In practice, however, they’ve wreaked havoc on the regulatory process. You might wonder: How could missed deadlines cause harm? The answer is a function of another unfortunate legislative innovation dating to the disco era. At the behest of environmental litigation groups, Congress during the 1970s included in many regulatory laws a provision granting the public the right to sue EPA over the non-performance of non-discretionary duties. As a result, groups like Sierra Club are empowered to sue the agency in order to compel the agency to act on a past-due responsibility. 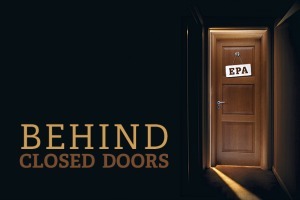 Because EPA is out of compliance with virtually all of its deadlines, it follows that establishing any deadline through litigation determines how EPA deploys its limited resources. Of course, giving priority among regulatory initiatives is no different than effectuating policy. To this end, impossible deadlines are conducive to a legal strategy known as “sue and settle.” The process starts when an environmental litigation group sues EPA over a missed deadline. Rather than contest the suit and defend the agency’s discretion, EPA immediately enters into settlement negotiations. Due to a revolving door between green groups and the EPA, parties to these suits often used to be colleagues. Thus, unelected bureaucrats and environmental special interests render policy by establishing agency priorities, far removed from voter accountability. In fact, most of EPA’s regulatory responsibilities pursuant to the Clean Air Act are dictated by sue and settle litigation. EPA’s inability to meet its duties in a timely fashion is largely a consequence of Congressional mismanagement, rather than agency indolence. Simply put, Congress added too many deadlines, and not enough appropriations to meet them. H.R. 2279, the REDO act, would help correct this mistake….